A few weeks back I got an invite from my cousin, Cindy, to a birthday celebration for her mom's 80th birthday. Her mom, Lori, is my mom's sister and the only one of her siblings still living. They live just south of Springfield and as the date of the party moved closer, I thought I'd try to get some work done while I was down in the area ~ and explore some places to do travel articles on or cover on my food and travel blogs. I got in touch with the Springfield Convention and Visitors Bureau and they assisted me with plans to visit some historic sites and notable eateries. As the plans were underway, something suddenly hit me. The Cubs were in the World Series and they'd be playing Cleveland in the World Series that Saturday - while I was in Springfield. Those who know anything about the Cubs, know that this World Series isn't just any World Series. It's the first time the Cubs have played in a World Series since 1945. And the last time they won a World Series was 1908!!! And anyone knows me, knows that I am a HUGE die-hard Cubs fan. As excited as I was about the birthday party for my aunt and seeing some sites in Springfield, I had a sudden feeling of panic. How would I watch the game? Throughout the playoffs I had been watching the game with family - my also die-hard Cubs fan Dad and/or my life-long die-hard Cubs fan son or my season-ticket holding die-hard sister or my doesn't-like-sports and really-knows-little about baseball husband who has even jumped on the bandwagon. How could I enjoy the game so far from home without any of those important Cubs fans? What channel would it be on? Would I be able to view it at my hotel? Would I be sadly watching a loss all alone? Would it be a huge win and I wouldn't have anyone to celebrate with? These are big thoughts and decisions for a Cubs fan whose team has never been past the division playoffs in my lifetime. I made plans to bring my 13-year-old son along. At least then if I had to watch it in a hotel room, I'd have some company from home. All my family who would be at the birthday celebration were Cardinal fans. They just don't understand the long string of misery and the need to watch and enjoy the game with other Cubs fans. And somehow, maybe because EVERYONE I know from that area is a Cardinals fan, I thought I'd be in alone in a city of Cardinals fans with no one to share in my enthusiasm. I went back and emailed my contact at the CVB to see if she could suggest a sports bar to me where the Cubs game would be broadcast. She came back with an answer better than I could have ever imagined. There would be a viewing party on Saturday evening on the lawn of the Old State Capitol with plans for food and drink and entertainment and old time baseballs to be thrown around as kids could play catch in the shadow of the dome of this historic building. I was ELATED. And it became one of the biggest highlights of the trip. Even up here near Chicago, when I've gone out to watch the game - at a restaurant or a craft brewery or a sports bar, you're surrounded by a lot of non-Cubs fans. Because our city is split, I end up around a lot of Sox fans (and some just aren't all that nice.) I can be sitting at a table jumping up and down at an outstanding play that Javier Baez just made or the amazing perfectly-time line drive hit by Addison Russell or Anthony Rizzo and the people around me are just not into it. It's kind of sad. For games 3, 4 and 5, the Cleveland Indians opened their stadium for a viewing party. In Chicago - nope nothing. You could head to the sports bars in Wrigleyville, where you knew you'd be surrounded by fans - but it could cost you up to $250 just to get in the door. And it wouldn't be a place I'd take my 13-year-old. 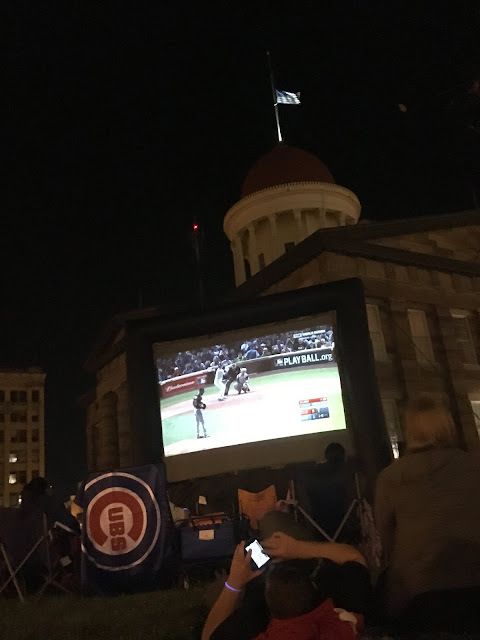 I also have to mention that the Cubbie spirit was displayed so well in Springfield and it was something totally unexpected. I saw W flags flying on homes and businesses. People walked down the street in Cubs gear. And everywhere I went, if I mentioned that I was visiting from Chicago or someone noticed my Cubs shirts, I heard, "Well, I'm a Cardinals fan, but I hope the Cubs win" more times than I can count. Those Cardinals fans were way classier than a lot of White Sox fans in Chicago. I could not have been in a more perfect place on Saturday night to watch the game. It was a family-friendly environment and everyone there was rooting for the Cubs. It was an environment I wouldn't have even be able to find living just 20 miles from downtown Chicago. And, as luck would have it, it was an unseasonably warm day. It got into the mid-80s in Springfield that day at at 8 p.m. that night it was still 73 degrees. But, we weren't so lucky with the game that night. Unfortunately, we lost game 4. However, the memory of taking in history in this wonderfully historic place on a beautiful night under the stars and the dome and the red, white and blue flying above that dome with my son is something I will cherish forever. Thanks Springfield, for being a perfect host for this Chicago Cubs fan on a very memorable night!